Today is the 3rd of a six wonderful maker mini series!! We are halfway through these powerhouse ladies. We officially arrived in the Southwest LAST NIGHT, so while I am busy getting our lives back in order, I asked some pretty sweet ladies to help me out. 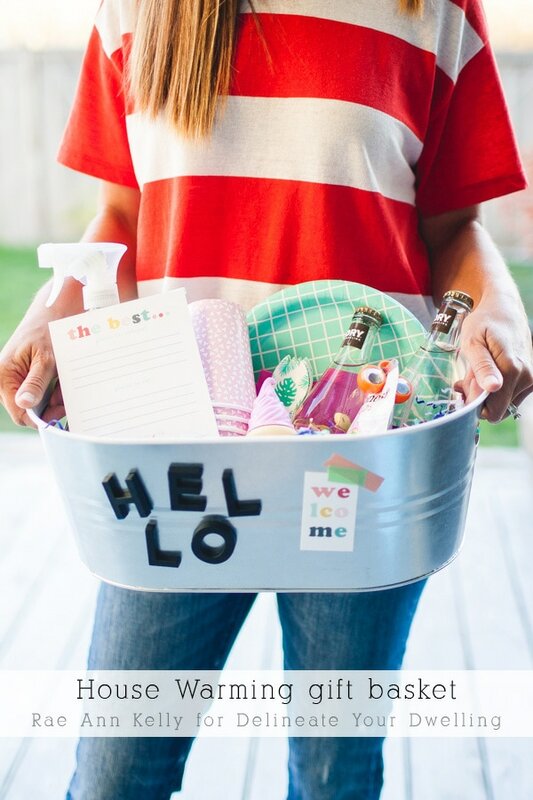 This week, Rae Ann Kelly is sharing the most adorable House Warming gift basket and including a free printable! Rae Ann Kelly is a lifestyle writer, designer, style guru and mom of 5 (woot woot). She is a creative powerhouse with a flare for kid friendly living. Rae enjoys finding ways to celebrate motherhood through travel, holidays, everyday moments, easy DIY’s, yummy food and (of course) good design. She is just plain cool and you might have seen her around here before! Hiii! My name’s Rae and I’m really excited to be here with you today! I’m also a graphic designer, blogger (at raeannkelly.com), and mom to 5 cuties. In the spirit of celebrating Amy and her new digs and moving season in general, I’m sharing this really fun, happy, and functional housewarming gift — including printables you download below! Most of us either know someone who is moving or will be welcoming new neighbors. 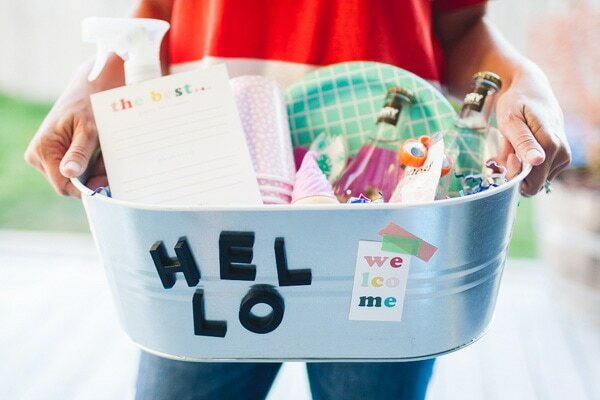 What better way to celebrate them while also rewarding all their hard work than with a basket full of goodies that will save them a trip to the store or from having to dig through boxes! Complete with a colorful gift tag and “BEST OF…” card that makes eating, getting around and playing in their new town a little less stressful! CLICK HERE to download. Then print on card stock and cut along dashed lines. Fill-in with your favorite spots to order out, eat at and play. We have new neighbors moving in next week. Knowing I’d be able to give it away soon made this project extra fun. Hope you’ll be able to use the printables and gift idea soon too! Thanks so much for playing along with me today! Would love for you to come say “HI!” over at raeannkelly.com! Thank you again, Rae Ann! 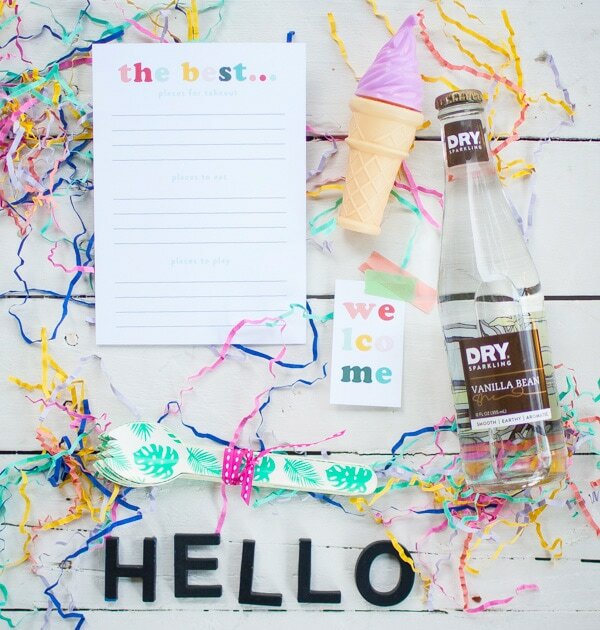 I love the thoughtfulness of a simple Welcome Basket and with these few cute touches, it becomes even better! Be sure to head over to Rae Ann’s site and give her some Delineate Your Dwelling love! You can also follow along with her here!